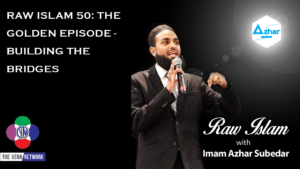 This week on the Raw Islam Podcast with Imam Azhar– a 2017 Podcast Award nominated podcast, we observe our Golden episode – number 50. B.C. Dodge opens the show by point out that this is the Golden episode of the Raw Islam Podcast – that is correct, this is the big 50. This podcast, and this network started in February of 2017, with just some phone calls and a few dreams. Since then we have added shows and been nominated for awards. And as, B.C. points out, none of this could have been done without the fans, the listeners, the downloaders, and the Facebookers. We would like to say thank you to all of you. And because this is our 50th episode, Imam Azhar is live from the Florida Gulf Coast University in Fort Myers Florida with 2 very special guests that are joining us to talk about finding common ground and building the bridge between communities. These young sisters speak about their interfaith work, which is about reaching across the table to extend a hand and explain what the true narrative is of Islam. As one of the sisters eluded to, if you do not tell your story, someone else may end up telling it for you – and their facts might not be right.